I think the only way to describe France's international side at the moment is "unsettled". Eighteen players have been cut from the Guy Noves 2017 6N squad (some players included in the 2018 squad were late call ups though). Notably Parra (Clermont) is back to steer the plays at 9 with the 21 year old Dupont (Toulouse) in reserve. The interesting inclusion of an experienced and on form 9 in Parra combined with two very inexperienced yet promising fly-halfs in Jalibert (Bordeaux) and Belleau (Toulon) could be a real winner. The likes of Huget, Spedding, Picamoles, Fofana Chouly, Trin-duc, Dousan and Lopez are all absent. There are solid danger men included in this squad such as the destructive and fast no.7 Macalou, Tauleigne and the fullback Palis who offers more in attack than Spedding did in my opinion. My overall feeling from this squad is Brunel wants to reinvigorate the team he has inherited and he has gone for a mixture of form, experience and youth. Dangerous stuff! The 23-23 draw vs Japan will be present in a lot of minds leading up to the 6N and I see most have written France off as 4th or 5th placers for this years tournament (going by the bookies). 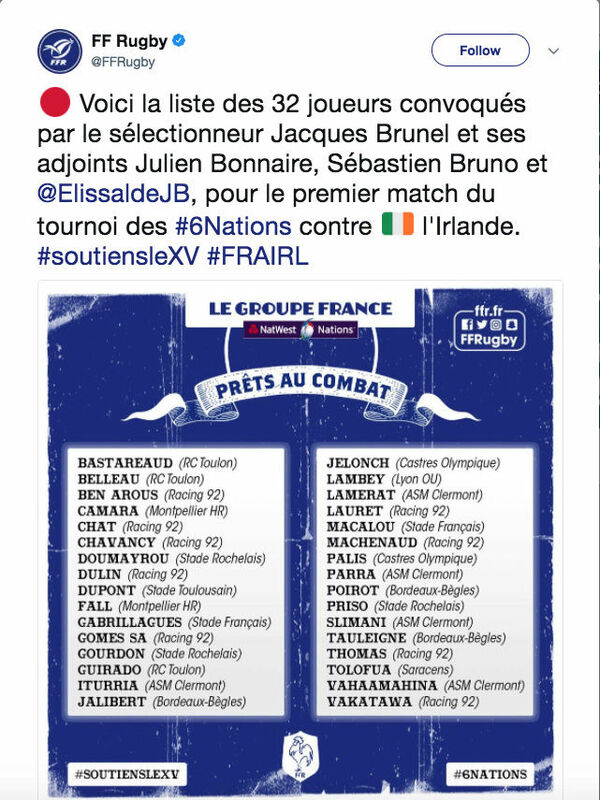 I personally predict France vs Ireland to be a cracker of a test match and I think Ireland will have to start well to snuff out this new French side who I imagine will be looking to come out and restore some pride in le coq gaulois! Yes. It's depressing debating with people who don't even have a dictionary. Sgt_Pooly wrote: Ok ok....we get it. As soon as it gets to the "you're wrong, no you're wrong" stage, you know it's time to give up. Well you have definitely added nothing to the conversation. What has happened to Serin? He looked really promising last season.